This is the high triangular face above Talbot’s south-eastern snow-field, visible from Homer Hut. Walk up the Gertrude Valley to Black Lake, cross the outlet of the lake (usually no more than a large jump) then continue up to the toe of the East Ridge. 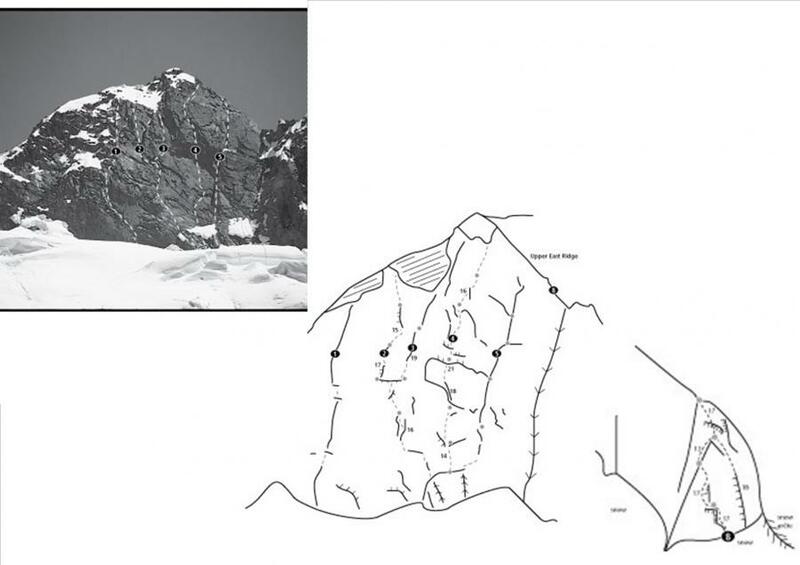 Traverse across the snowfield until below the face. In late summer the snowfield becomes broken by numerous large crevasses making access to the Summit Pyramid difficult. Crampons may be required. To access the Summit Pyramid either climb the Notch Route out of the valley or walk up the Gertrude Valley, traversing across exposed snow slopes below the east ridge to the base of the wall. The rock deteriorates towards the top. Finish on the South Ridge, just a short scramble to the summit. Murray Jones, George Harris, Jan 1968. Climb the first three pitches of Sphinx then left along a ledge. Climb a hand crack directly off the ledge (crux) to a left facing corner. Then at the base of a large gully move left into an offwidth. Marty Beare, Lindsay Main, 1980. Initial slab pitches follow a series of short right facing corners to a ledge. Devious moves left then right to gain a stunning right facing corner halfway up the face. 40m of jamming. Stu Allan, Bill Denz, 1978. Starts 30m left of the JC crack on the left side of a rib. The route tends right over some easy ledges before moving left onto the grey slab. Continue up, passing the roof above. This climb has a reputation for being both hard and committing with minimal protection. Yet is one of the more classic lines in the region. Bill Denz, Calum Hudson, 1978. The prominent crack-line near the right side of the face: damp at times. Climb four pleasant pitches up the initial corner. Pitches five and six follow a crack line through the top wall and are airy but not severe. Climbed mainly on rock protection. Geoff Gabites, Nigel Perry, July 1982. An unlikely line that breaks left from the J-C Crack up overlaps. 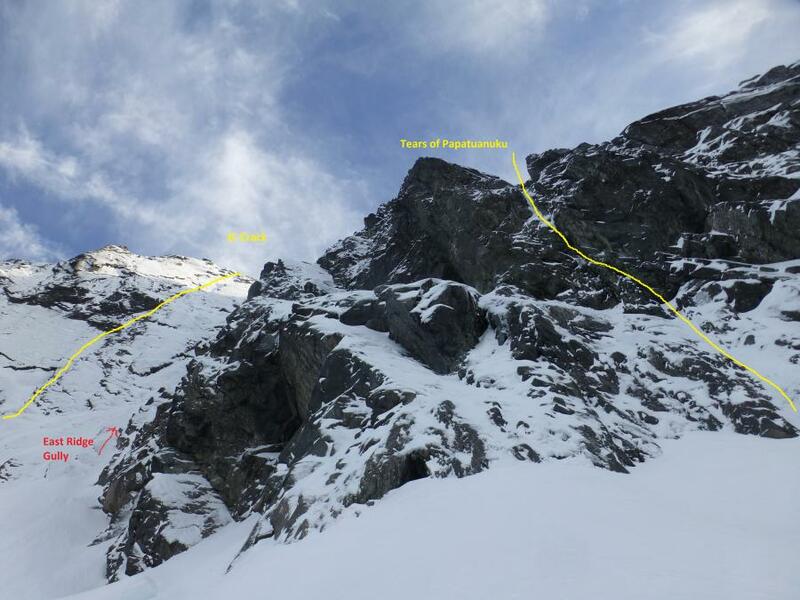 5 Pitches: The route lies immediately right of the gully on the right-hand side of the Summit Pyramid. Quality rock with 6 aid moves. Follows an obvious gully between thr Summit Pyramid and the East Ridge. On buttress to right of East Ridge Gully. Up an overhanging chimney to a hanging ice dagger. Very steep and pumpy to pull onto ice, not climbed clean on FA. Nice ice gully above to gain E ridge.